Library Advocate. 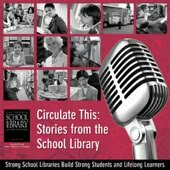 : iTunes - "Circulate This: Stories From the School Library"
iTunes - "Circulate This: Stories From the School Library"
The California School Library Association uploaded its audio download to Apple's iTunes as a podcast. Connie Hamner Williams says to go to the iTunes store and click on podcasts, then search for "California School Library Association" or "school libraries"....You will see the CSLA audio journal "Circulate This: Stories From the School Library". Price = FREE. In other news, Connie reports that she is looking into additional ways to collect and showcase the great number of stories from and about school libraries.